Part of the Eldeco Utopia complex, Eldeco Olympia is a testimony of high-end luxury living which will be one of its kind in Noida. The project offers 3 bedroom air-conditioned apartments housed in 2 towers of G+22 each. 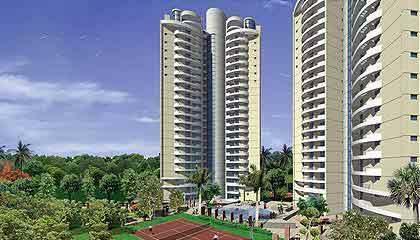 Its unmatched perfection and evolved aesthetics comes with thoughtfulness of luxury and open green spaces. A well-appointed living space snugly located on prime residential land, Olympia is nestled amidst lush green surroundings with a green belt setting. It is a complex within a complex with self-sufficient facilities. Hi-end specifications including Modular Kitchens and Italian Marble Flooring, Jacuzzi in master bedroom, lifestyle amenities such as Clubhouse with Swimming Pool, Banquet halls, Guest Rooms, Sauna/Jacuzzi, Billiards/Table Tennis along with environmentally sensitive measures makes this project highly sought after. The surrounding green cover provides much needed relief against pollution. Beautifully landscaped gardens, tree-lined avenues & walkways showcase nature in all its glory.